Kate Mattingly, a BCNM Designated Emphasis candidate in Theater, Dance, and Performance Studies, recaps Mary Flanagan’s History and Theory of New Media Lecture Series lecture “Critical Play,” which took place on March 17, 2016. In entertainment sectors, a “triple threat” refers to performers who can sing, dance, and act exceptionally well, merging three seemingly distinct talents into one person. Mary Flanagan is a “triple threat” of game studies: she creates, designs, and publishes with seemingly ceaseless ingenuity and curiosity. 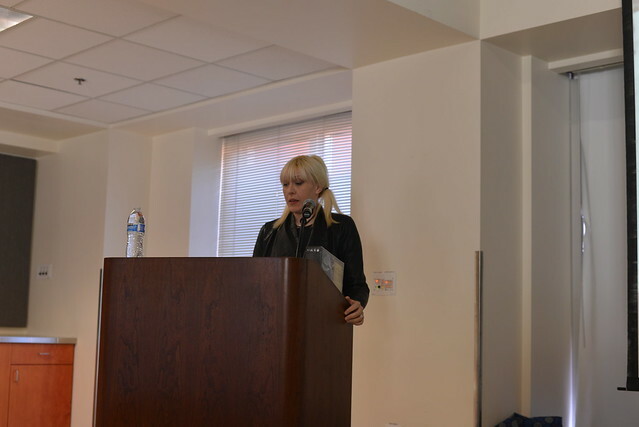 At UC Berkeley on March 17, Flanagan visited Gail De Kosnik’s seminar in the History and Theory of New Media, where she discussed game design, social change, and her own projects, as well as recent conversations she’d been involved in that day as part of San Francisco’s Game Developers Conference 2016. Then at 5pm she delivered the final talk of the semester for the History and Theory of New Media lecture series. Entitled “Critical Play,” this presentation detailed histories of “critical” game design. It drew from Flanagan’s theories in her acclaimed books Critical Play: Radical Game Design (MIT Press, 2009) and, with NYU’s Helen Nissenbaum, Values at Play in Digital Games (MIT Press, 2014). For Flanagan, the Sherman Fairchild Distinguished Professor in Digital Humanities at Dartmouth College, the word “critical” involves a type of analysis or inquiry and the word “play” suggests whimsy or fantasy. So the phrase “critical play” implies a contradiction, a kind of “analytical whimsy,” and it’s this paradox that she limns in her research and designs. Her first proposition, “Critical play examines dominant values,” foregrounds how games interrogate the ideologies of historical moments, such as the gendered and sexualized stereotypes we see in everyday life and narratives. Related to this idea, projects that dismantle an “achievement ideology”––level up or you’re dead––can be both jarring as well as educational and revealing. Flanagan offered these examples as ways of pointing to the potential of gaming to intervene in oppressive structures, and her own designs of games like Buffalo can reconfigure users’ racial and gender stereotypes. Flanagan’s examples of games’ roles in cultures spanned from the 13th century BC (The Book of the Dead, written by the 19th dynasty royal scribe Hunefer) to 17th century Dutch objects (Poppenhuis of Petronella Oortman) to 21st century digital installation (Cory Arcangel’s “Super Mario Clouds”). Flanagan emphasized how games reflect our attitudes towards gender relations (the first chess set had no female pieces) and offer opportunities to engage different cultural groups in shared, even collaborative, activities. Ultimately, Flanagan believes games hold possibilities for socially positive and transformative change. For this reason her research sites span artistic, commercial, and educational sectors, and she has served on the White House Office of Science and Technology Policy (OSTP) Academic Consortium on Games for Impact. Her work has been supported by commissions and grants including The British Arts Council, the National Science Foundation, the National Institute of Justice, the National Endowment for the Humanities, Robert Wood Johnson Foundation (with Digital Mill), and the Institute of Museum and Library Services.